The Cuisinart MCP19-16N multiclad pro stainless steel saucepan is perfect for preparing hollandaise sauce, steaming savory wild rice or simmering a hearty soup. The saucepan features Heat Surround™ Technology which allows even heat distribution across the bottom and side walls of the cookware. The pan has core of pure aluminum in bonded to 18/10 stainless steel interior and a brushed stainless exterior for unsurpassed cooking performance. The Cool Grip™ Handles stay cool on the stovetop, while its lid seals in moisture and nutrients for healthier, more flavorful results. The Multiclad Pro Triple Ply 1.5Qt Saucepans Stainless has many exciting features for users of all types. 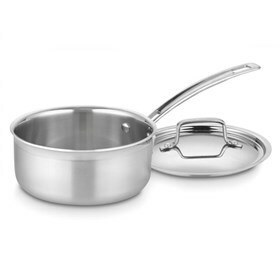 See the Multiclad Pro Triple Ply 1.5Qt Saucepans Stainless gallery images above for more product views. The Multiclad Pro Triple Ply 1.5Qt Saucepans Stainless is sold as a Brand New Unopened Item.